I don’t get a lot of opportunity to bring my mom on trips, so when I had the chance to take her to Northern California’s Wine Country for a few days, I was excited at the prospect. My mom never really drank wine, or any liquor for that matter. It wasn’t until after I started focusing my writing on wine and spirits – and the destinations they are made in – that she decided she was really missing out. In her senior years she’s learned to appreciate a glass of wine before, during or after dinner and is always excited about trying one she hasn’t had before. Our first stop in wine country was at one of my favorite places, Francis Ford Coppola Winery. I was excited to show Mom all of the movie memorabilia, which includes a display of awards, including Coppola’s Oscars. After the tour we sat down for lunch at Rustic, the onsite restaurant which never disappoints. It was my fourth visit and I was thrilled to find the Braciole was on the menu (“Francis Favorites” are rotated so you never know which one will be available). We started with the garlic-filled Roasted Eggplant before my delicious Braciole arrived along with Mom’s Lemon Chicken. Then we headed to the bar for a tasting. I discovered the 2012 Sofia Rose, a wine that goes with everything. 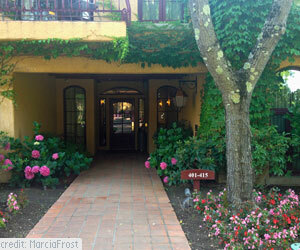 Home base for this trip was Vintner’s Inn, a charming four diamond hotel in Sonoma. With only 44 rooms spread throughout four buildings, surrounded by acres of vineyards, I really loved the feeling of over understated luxury. Our room was large and beautiful and I loved the little patio filled with flowers and vines. It was also just a short walk from there to the whirlpool, where I quickly got into relaxation mode. Dinner was in downtown Sonoma at the Girl & the Fig, another favorite of mine. They do French right here, not in an over-the-top fine dining experience, but as you would find in a Parisian café. I started with a Fig Royale as we nibbled a selection of cheeses. The Grilled Fig & Arugula Salad (with pecans, Chevre cheese and pancetta) was great and the Croques Monsieur was just as I liked it, creamy and flavorful, without being too rich. It was only matched by the goat cheesecake for dessert. After a good night’s sleep, I enjoyed a veggie –filled wrap and warm scone at Vintner’s Inn before heading to Domaine Carneros in Napa. Mom decided to sleep in while I explored this huge estate centered on what I could only call a castle. 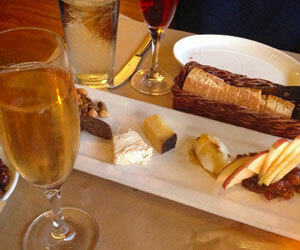 Sparkling wine is the draw here and the know how to make it as well as they do in Champagne. The tastings are done in relaxing tables (inside or out) rather than at a bar so that you are free to ask questions, pick the wines of your choosing and even linger with cheese and/or charcuterie. I chose not to eat anything because I was off to lunch at The Lodge at Sonoma Renaissance Resort & Spa at their Carneros Bistro & Bar. While the club sandwich was good, nothing could beat the dessert. 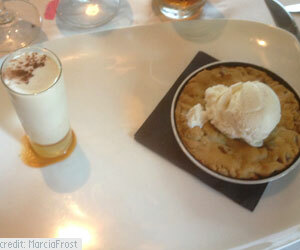 It was called “Cookies ‘n Cream” and consisted of a fresh out of the oven chocolate chip pecan cookie with ice cream. On the side was a shot of Kahlua and the waitress told me I had the choice of drinking it separately or pouring it on top of the cookies and ice cream. I couldn’t make up my mind, so I drank half and poured the rest on top! The only thing I could imagine would be more heavenly at the Sonoma Renaissance Resort was to have a day to spend at their Raindance Spa. Everything from the aromatic smells to the relaxing décor was calling me. I went back to the hotel to pick Mom up for our final stop – MacPhail Family Wine. It was a relaxing tasting arranged by my friend Jim Morris as James MacPhail took us through his wines. I had never been to a winery that focused only on two grapes (pinot noir and chardonnay), but they certainly mastered them both. I am looking forward to going back to see MacPhail again in their new location at The Barlow in Sebastopol. Our final stop in California Wine Country was actually at a new place, Empire in Napa. I loved this place, from the décor (an eclectic mix of modern and antique) to the hand-crafted cocktails and unique menu (lamb belly, anyone?). It’s nice to see a town so focused on wine have a completely different offering, something Mom and I toasted to with their sangria, changed often to match the latest in the area’s markets.